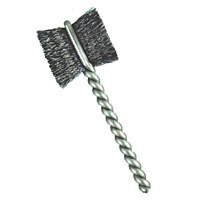 Clean and polish blind threaded holes, tubes and cylinders with miniature paddle brushes. The fills are made with stainless or carbon steel and are designed to minimize flexing. Brush holders help extend the length of the brush so you can clean those hard-to-reach spaces.